Racing Hero: Dale "The Intimidator" Earnhardt, Sr. - his name says it all! Crew: "Pop", Charlie, the Nelsons, Craig. Sponsors & Support: Laborers Local 430, Nelsons A/C Service, At a Glance, Wheeler Iron, and special thanks to Dave Parker!! 2nd place in the first annual Mini-Van Olympics at Interstate Speedway...but won the jump!!! Got involved through my husband and his relatives - Jeff Brunsen, Tim Beltz, and Craig Clift. I have been involved in many Enduros and most of the Mini-Van Olympics. My husband and I were mostly involved in helping in the pits and special event races. I'm happy I get my very own car to race this year! To at least win one trophy and not roll over... That way I win the bet!!! 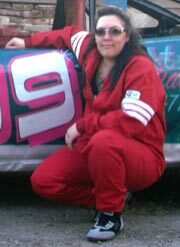 We have always used #99 for all our cars, and the BONEHEAD RACING in remembrance to Chad "Wild Child" Norris. 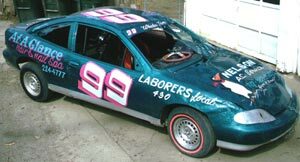 Charles has lettered/painted lots of Stock Cars during this and previous years. I've met a lot of interesting people over the years being in the pits and stands, and love it! !